“Shadow Tactics: Blades of the Shogun” takes the stealth genre of games and cranks up its aspects to eleven. Released on Steam on December 6, 2016 by Mimimi Productions, “Shadow Tactics” follows a group of five playable characters on a series of missions taking place in Japan during the Edo period. While the fate of the country rests on the player’s shoulders, the moment-by-moment gameplay of “Shadow Tactics” makes such grand expectations obsolete in a struggle against overwhelming odds. When one opens the game, they are greeted by a fairly decent art design. Everything looks as one would expect from a game set in the Edo period, and is surprisingly detailed in its level of design. In fact, one could say it comes as a detriment to the game, concealing otherwise obvious routes and intractable objects to the naked eye. Thankfully, this problem is few and far between with a helpful user interface to steer the player forward. If one is going to be playing “Shadow Tactics” for long sessions, then it is highly recommended to turn off character banter. As each character performs his or her actions, they always spout off the same one-liner, and this applies to the enemies too. It does not matter if one changes the language, it gets old fast. The music and sound design for “Shadow Tactics” are much better though, and makes the missions feel more than just a level for the player to go through. The gameplay is the true heart of “Shadow Tactics,” and it lives up to expectations. Everything that one would come to expect with stealth games is present in “Shadow Tactics,” with the difficulty taken to an extreme. Thankfully, there is a quick save system in place and missions never have a time limit, so the player has all the freedom in the world to tweak their strategy. These will be the only graces the game gives you, however, and the player will likely need full use of them as unexpected problems or failed maneuvers occur. There is nothing helping the player when a plan goes awry, other than to step back a few seconds and trying again. It is this same quick jump in time that lends “Shadow Tactics” to be engaging throughout its missions, and prevents the player from having to trek through long sections of the level only to encounter a different problem. All this is before specific mechanics are even addressed. “Shadow Tactics” employs many strict rulesets borrowed from other isometric stealth games, ranging from manipulating vision, baiting an unwary guard or turning his head away while his friend is taken out. 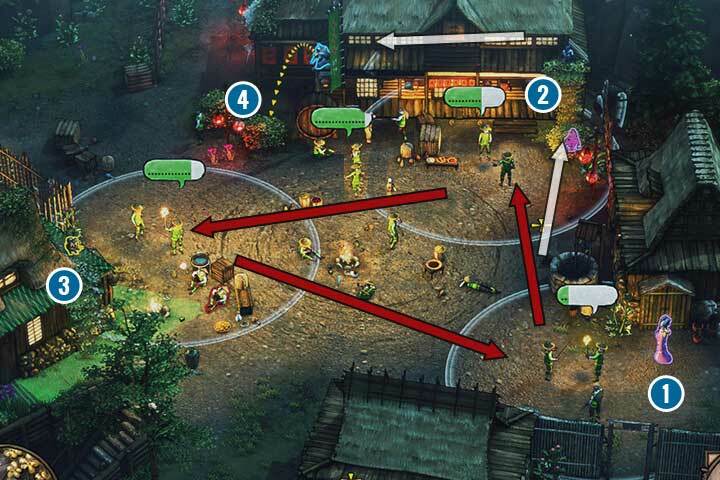 It is up to one’s ability as the player to get around these rules and beat “Shadow Tactics” at its own game. To help one towards this goal, there are multiple characters that can be used independently on the same mission and can be commanded to execute a plan as one cohesive unit. Have a sniper eliminate a watchful eye as an assassin closes the distance, or distract a guard with footprints to help another character slip by unnoticed. It is these slow thinking processes, yet fast and precise actions that makes the “Shadow Tactics” gameplay a jewel to behold and even better to play firsthand. Despite its rather obscure developer, “Shadow Tactics” makes its name known for any fan of stealth games. While its artistic aspect leaves some things to be desired, the meat and bones of “Shadow Tactics” offers a fun, if challenging runtime. Should one pick up this game, they can expect it to last anywhere between 20 to 30 hours.